Since I recently mentioned a popular atheist-related meme I don't particularly care for, I thought it was only fair to mention a far less popular one that I like. This one not only has a great image but communicates something that needs to be communicated until more people are able to wrap their heads around it: it does not make sense to take offense merely because others do not share one's beliefs. And yes, to do so would seem to indicate that the beliefs in question are awfully fragile. It is difficult to imagine that any religious believer who is secure in his or her faith would be even mildly bothered by an encounter with someone who did not share his or her beliefs. And yet, many religious believers seem to be more than a little bothered by those of us who do not believe in their gods. Some even go out of their way to troll us, seeking us out and stirring up trouble. It is almost as if our very existence is viewed as problematic in some way. It seems to me that this is the sort of thing one does when one is unsure of one's faith and trying to reassure oneself. 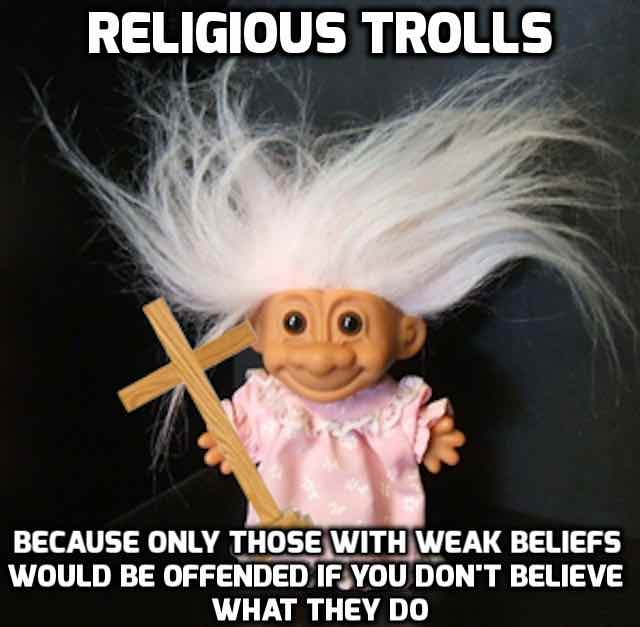 If that is indeed the case, then perhaps we atheists should look at religious trolls as an opportunity. They wouldn't be here if they weren't conflicted. Maybe some are even on the verge of abandoning their precarious faith. Maybe we can help them decide to take the plunge. And if not, maybe we can at least provide them with an opportunity to realize that some of their stereotypes about atheists are inaccurate. I'm not going to suggest that some religious trolls aren't annoying or that we should tolerate their presence when they are annoying. I'm merely suggesting that there might be something to the idea that they come to us from a place of weak faith and that this might be something helpful to consider if we do decide to interact with them. As to whether interacting with them is worth our time, I think we each have to make that decision for ourselves.